Preheat oven to 325 degrees. Line an 8x8 pan with tin foil. First, make the crust. Mix together the melted butter, graham cracker crumbs, sugar, cinnamon, and salt. Press into the bottom of the lined pan. Bake for 15-20 minutes. Prepare the brownie mixture as listed on the box. Pour the batter over the baked crust and bake per directions on the box, about 35-40 minutes. Remove pan from the oven and change your oven setting to broil. 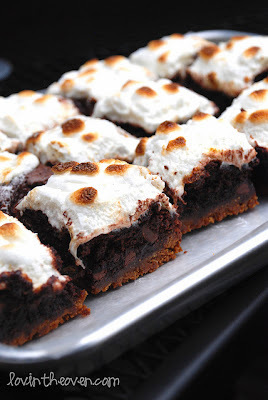 Sprinkle the mini marshmallows on top of the baked brownies and pop back in the oven for a minute or two until the marshmallows lightly brown. Make sure to keep an eye on it because this process happens very quickly! Let cool completely and cut with a cold, wet knife.